Posts x 4: 4 x 25mm (1inch) diameter chrome plated steel posts 915mm (3ft) Long. Each wire shelving post comes with an adjustable foot for leveling the shelf unit on uneven ground. 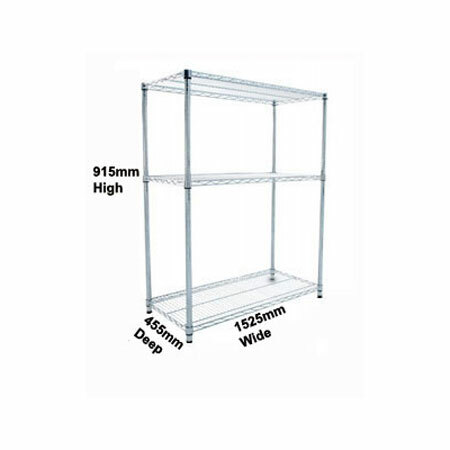 Shelves x 3: 3 x 1525mm (4ft) wide x 455mm (18inch) deep chrome plated steel wire shelves capable of carrying 150kg (330lbs) per shelf.